She filled out the little white piece of paper and folded it in half. It couldn’t have been easy. I imagine pride built knots in her stomach, causing her to hesitate as she proceeded to stuff the paper into the box with trembling fingers. She hurried us towards the sliding doors. I sensed that her first breath in minutes came as we stepped into the brisk November air after exiting the market. The grocery budget was slim. Four growing kids ensured that what little there was, didn’t last long. There simply wasn’t enough for their traditional Thanksgiving dinner. She tried to stretch the wallet, but reality had other plans. The younger ones most likely would have never noticed, really. She tried not to dwell on it, but we all know how that goes. 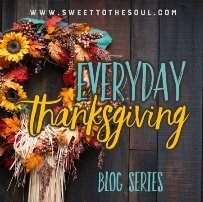 As the day approached, she prayed for God to fill her heart with gratitude for what they had. She truly was thankful for anything, after all. I’ll never know exactly how my sweet momma felt in that moment. I was old enough to know that things were rough. Old enough to know what Thanksgiving looked like before. Old enough to know that she wanted more for us. She tried… hard. I had never been so excited about a bird in my life, and I’m sure her elation far exceeded mine. I don’t know whether or not my mom sent up turkey specific prayers that year. Maybe she prayed that her name would be drawn. Or maybe, her prayer was simply “Help.” And God answered in a way that He knew we needed at that time. He’s good like that, isn’t He? I can almost assure you that my mom wasn’t expecting to get that phone call. It’s not that she questioned God’s faithfulness, but she knew that His ways don’t always look like the obvious. That time, they did. What if we hadn’t won the turkey? Would our needs have been met if we’d gathered around the table with a plate of hot dogs on that November Thursday? Oh, yes. We don’t always see it that way, do we? We pray for the turkey. Sometimes we get it, and sometimes, we get hot dogs. Other times, it’s warm soup after waiting in line at the homeless shelter. Others, it’s scavenging for berries, because food in the village has been scarce for some time. And sometimes, it’s going to bed hungry and thanking God for the breath to have seen another day. God’s provision manifests itself in many different, incredible forms. That’s part of the beauty in the mystery of His ways. Though they may not always seem magnificent in the moment, may we strive to open our eyes to what He is doing in our everyday. Would I have learned a beautiful lesson of God’s faithfulness, had we not eaten turkey that year? I can’t say for sure; but oh, dear Lord, I pray so. I pray that He would have opened my eyes to see His goodness in another way, as He has numerous times since then. I’m completely wrecked when I consider how God has shown up big in my life, time after time. I continue to be overwhelmed by Him. May we show Him gratitude today… just because of who He is, no strings attached. May we trust Him for the turkeys, and thank Him for the berries. May we stand in awe of Him, for His big ways and small. As long as I have breath, I am blessed. May we be reminded to use that breath to praise Him always. Sweet Heavenly Father, thank you for showing up in our lives exactly as we need. Your ways… your timing… you… they are all perfection. And we are completely undeserving, but ever so grateful. Thank you for the breath to live another moment. And for offering an eternal Home, when that last breath slips away. Thank you for the beauty around us; may you open our hearts to recognize it. We praise you for who you are. We give you thanks for your goodness and your mercy, and we love you, Lord. You are good. You are beautiful. In Jesus name, Amen. Connect with Crystal on her blog: Crystal Hornback: Ebracing a Perfectly Imperfect Life. Beautiful word today, Crystal! I really love this. Sometimes we pray for the Turkey, but God gives Hot Dogs. Thanks for your insight today, friend! Thank you for your sweet words, Betsy! I so enjoyed your post as well! Crystal, this so tugged at my heart as a mom. And we had a couple of seasons of very lean times. I loved "we pray for the turkey... but get hot dogs"! and the reality that God does provide! oh yes! "May we trust Him for the turkeys and thank Him for the berries"
Wonderful wisdom here! Thank you for sharing this touching snapshot from your past and the message God has placed on your heart. I can't even begin to Thank God for all the blessing in my life, He's blessed my life so many ways that I could literally fall to my knees and cry... Not in sadness but in awe. There are no words, only love and pride for you and my 3 other beautiful children, I wouldn't be the woman I am if not for all of you. God has given you such a beautiful gift and I am so proud of you! Love you my Lil' Sunshine!